The trans-pacific airline known as Hawaiian Airlines connects the Asian mainland with North America through its centrally based hub, Honolulu, Hawaii. Founded during the dawn of commercial airlines, Hawaiian Airlines has developed an excellent reputation of safety and efficiency. 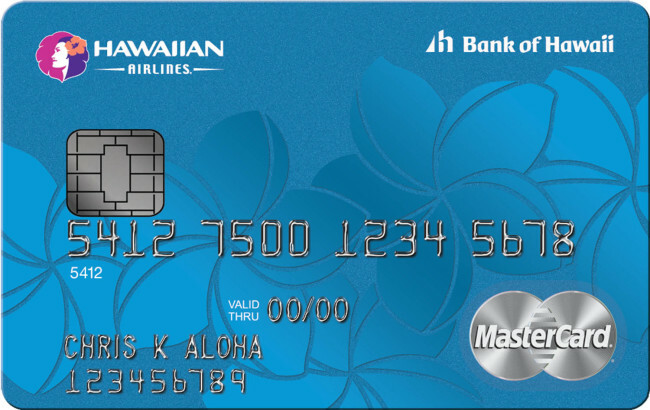 Looking to offer more for its customers, Hawaiian Airlines offers a travel credit card that aligns with the interests of a traveling consumer which offers deals relating to airfare as well as partner deals. This credit card, the Hawaiian Airlines World Elite Mastercard, is an excellent way to capitalize on Pacific travel. Like most ﻿airl﻿ine credit ﻿car﻿ds, the World Elite Mastercard offers a bonus mile program of sorts where cardholders gain build up miles (in this case HawaiianMiles) for redemption of travel rewards. If new card applicants spend $1,000 using their World Elite Mastercard within the first 90 days of account activation, a reward of 35,000 bonus HawaiianMiles is received which is a considerable return compared to the normal rate. More than one bonus offer is available to cardholders, and this offer can occur annually depending on purchase history. If a cardholder spends over $10,000 with the World Elite Mastercard in a year, a bonus gift of 5,000 HawaiianMiles is awarded. In addition to these bonus offerings, there are several different ways to earn HawaiianMiles on different types of purchases. The quickest way is to spend money at select HawaiianMiles partners such as GAP, Old Navy, Banana Republic, Whole Foods, CVS, and Lowe’s; every dollar spent at these stores earns ten HawaiianMiles which is a good rate c﻿﻿﻿﻿﻿﻿﻿ompared to othe﻿﻿r airline competitors﻿﻿. There are two other rates in which HawaiianMiles are earned. First, direct purchases at Hawaiian Airlines earn two HawaiianMiles for every dollar spent. Second, a standard single HawaiianMile is earned for each dollar spent on regular purchases. These miles do not expire or receive any limitations. Interestingly enough, these miles can be shared between Hawaiian Airlines World Elite Mastercard accounts through the system known as ShareMiles. A simple transfer through the online site allows friends and family to receive these miles which is perfect for birthday or anniversary gifts. Despite multiple ways to earn and share bonus miles, there are still more benefits for obtaining the World Elite Mastercard with Hawaiian Airlines when it comes to travel. A one-time 50% discount on a companion’s ticket is offered for travel between Hawaii and North America. Additionally, cardholders receive an annual $100 discount on companion tickets on round trip flights between Hawaii and North America, and World Elite cardholders receive a complimentary first bag check every time traveling with Hawaiian Airlines. An annual fee of $89 is required in order to maintain an account with Hawaiian Airlines. There are various standard transaction fees accompanying this card. Balance transfers receive a $5 or 3% fee for each transaction; similarly, cash advance fees total either $10 or 5% with the decision between differing rates going to the greater value. Since the Hawaiian Airlines World Elite Mastercard most likely sees it use on travel across the Pacific, there is no foreign transaction fee on any purchases made abroad. There are two penalty fees for late payments and returned payments: in the event of either a maximum value of $37 may be charged to the cardholder. These values may range anywhere from almost nothing to the maximum depending on the state of residency. Several different annual percentage rates (APR) apply for regular purchases: 16.24%, 20.24%, or 25.24% apply depending on credit history. The APR for balance transfers starts out at 0% for the first fifteen billing cycles which reverts to the same rates for regular purchases. Cash advance APR runs at 25.49%. These rates are all variable. For anyone who plans on traveling through Hawaii consistently, the Hawaiian Airlines World Elite Mastercard offers considerable benefits that can be applied to alleviate these expenses. It offers a way to essentially earn discounts on travel through everyday expenses. Overall, the World Elite Mastercard offers quite a bit for its users, and any Pacific Ocean traveler would do well to obtain such a card.